Babyhood is all about discovery; experiencing everything for the first time and making sense of everything around you. From seeing new colors and textures to discovering how everything in your body works whether that’s your legs or your mouth, which explains why you always see kids and babies putting everything in their mouth. With the sense of discovery driving them, it’s very common for babies to develop some habits that we see all the time, like finger or thumb sucking. These habits are perfectly harmless and provide a sense of comfort for toddlers. However, as the child gets older, the thumb sucking can be detrimental to their oral health and development. For most children, the thumb sucking habit typically stops on its own by the time they are between the ages of two and four. The danger lies in if they maintain this habit after their primary (baby) teeth have come in. 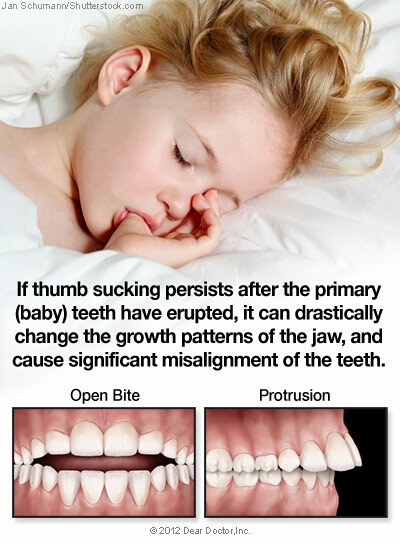 During this stage of rapid growth, the action of sucking on a thumb or finger puts constant pressure on the teeth and developing jaw bone, which will actually cause the bone to become deformed or stunt its growth. This results in teeth that appear to flare out or become severely misaligned, which are conditions known as open bite or crossbite. Like finger sucking, tongue thrusting is a common behavior in young children which is part of the natural infantile swallowing pattern. Tongue thrusting is when the tongue protrudes through the teeth, most often when speaking, eating, or just having the tongue be at rest. This habit should typically go away naturally by the age of six, but it is possible for the habit to persist. If this occurs, continued tongue thrusting will put pressure on the teeth and jaw bone, possibly leading to issues with tooth alignment and skeletal development. Once your child’s habit of thumb sucking or tongue thrusting persists past that typical age range where they should stop, they become challenging habits to break. While there are many at-home remedies and methods out there that can help your child kick the habit, their success rates are not all that consistent. For a more reliable solution which can help break these habits and ensure they avoid developing serious bite problems, the pediatric dental and orthodontic experts here at Elite Smiles Chastain can provide your child with a “habit appliance”. These habit appliances are designed to protect your child’s teeth and jaw bone during development from the pressure caused by thumb sucking and tongue thrusting. How Do Habit Appliances Work? One example of a habit appliance is called a “palatal crib”, which is a small appliance that is worn inside the mouth and is attached to the upper teeth. Using a set of semicircular wires, we can block the thumb or finger from coming into contact with the gums behind the front teeth. What this does is take away the sensation your child gets from thumb sucking, which will lead to a natural inclination to stop the habit. A similar appliance can also be used for cases of tongue thrusting. At Elite Smiles Chastain, each habit appliance is custom made, meaning your child will get a personalized appliance designed to fit comfortably. To ensure absolute precision, we use high-quality photos and scans using our Itero Scanner system when creating your child’s appliance. Once it’s created, we place the appliance at the next appointment, and periodically monitor your child’s progress in term so oral development and breaking the habit over the course of 6 months. 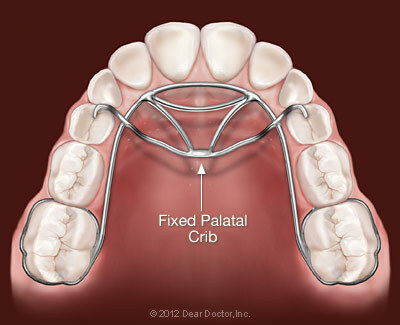 While habit appliances like palatal cribs are typically not painful, your child may experience some soreness for a few hours after it’s placed. It’s also common for children to have difficulty sleeping for the first few nights as they adjust to the feeling of their new appliance. To avoid any damage to the appliance, we recommend avoiding any hard or sticky food. Let Us Help Protect Your Child’s Smile! If your children have any bad habits like finger sucking or tongue thrusting that has persisted beyond the normal age range, schedule an appointment with Elite Smiles Chastain at our local office here in Atlanta, GA. We specialize in pediatric orthodontics and dental care, so you can be confident your kids are in the right hands, getting the quality treatment they need to have perfectly healthy smiles. If you have any questions about habit treatment with thumb and finger appliances, just contact us to connect with a member of our knowledgeable and friendly team who will happily help you get all of the information you need. We look forward to helping build a brighter future for your family with healthy, radiant smiles!